It’s tax season. And as a small business owner, that may mean it’s the time of year that you fear the most. But fret not — your local Fort Collins CPA firm is here to help. At O’Dell & Company, we specialize in providing reliable assistance to small businesses when it comes to tax planning, preparation, and strategies. We want to help your business grow and thrive, no matter if you’re here in Fort Collins, Denver, or anywhere else across the country. Why do we do it? Because we too are a locally owned and operated business, and we understand the intricacies involved with small business tax planning better than most. In this blog, we’re going to be providing a few general tips and things to look for when the time comes for your small business to complete its taxes. Our team of certified public accountants have the experience and know-how to ensure that your tax savings are as high as can be, while also ensuring that your business is safe and secure throughout the year. 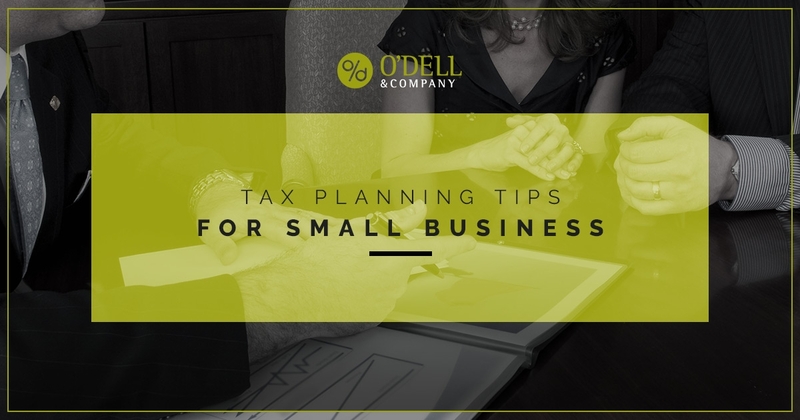 Keep reading to learn a few tax planning tips for small businesses and contact O’Dell & Company today to get started. Tax laws change as frequently as the calendar. As a small business owner, it’s imperative that you know the ins and outs of how the new laws can affect your business, and more importantly, how they affect your taxes. But because you’re running a small business, which is a complicated endeavor on its own, it can be difficult and even downright impossible to stay abreast with every change to the law. That’s why it’s important to have a small business CPA firm on your side. At O’Dell & Company, we’ll worry about the details and intricacies of the new tax laws so that you can continue on with your daily operations. We’ll also take the time to communicate any changes or modifications to the laws as we move throughout the tax planning process, so that you can have a better grasp on what’s going on. Obviously, knowing the deadline for filing your small business taxes is a critical aspect of planning and preparation. The deadline may vary, depending on your type of business entity — which is another reason why a CPA firm is important during this process. To know exactly which deadline(s) apply to you and/or your businesses, certainly contact your local CPA firm. Filing taxes for a small business requires loads (and loads) of paperwork, as you likely know at this point. However, this process can be streamlined and optimized greatly if you take the time throughout the year to get your financial ducks in a row, so to speak. This is where automated bookkeeping and accounting services can come into play. By utilizing cloud-based accounting software, you can greatly minimize the amount of paperwork and scrambling you have to do once tax time comes around. In fact, a CPA firm can get you set up with a customized business bookkeeping solution so that you don’t have to worry about your accounts payable, receivable, payroll, and other accounting aspects. Having an automated system in place can help save you time and money when filing your business taxes. Right around tax time, you may be considering purchasing new equipment, paying big bucks to market your business, or having some other sort of large expense. The reason for this is because you may be able to deduct this expense on your taxes. However, it’s important to recognize how exactly this expense will affect your taxes — because every dollar spent does not always automatically mean an equal amount of savings on your taxes. Know how the expense will affect your deduction, and if a large expense (or revenue, for that matter) will alter your savings and/or tax bracket. A certified business accounting firm can help you with this aspect as well, walking you through your various options to ensure that your bottom line is protected. Small business tax planning and business consulting are a couple of our staples here at O’Dell & Company, so feel free to contact us if you’re looking for assistance in these areas. As we’ve said throughout, a trustworthy local CPA firm can help you with the tax planning process from start to finish. Your company’s tax strategy should not be entrusted to just anyone, however. It’s important that you find a CPA firm with local roots, which has the health of your business in mind. At O’Dell & Company, we are happy to provide our trusted CPA services to clients in Fort Collins, Denver, and beyond. We’ve been in the business for decades, and have built a reputation on listening to our clients needs and delivering exactly what they came to us for. What’s the catch? Well, you have to call. Contact our accounting firm today to learn more.